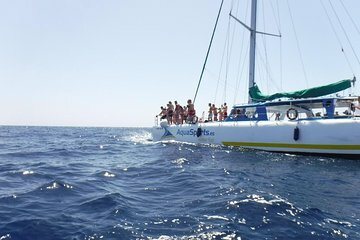 Cruise along the Puerto de Mogán coast aboard the Magic Tres catamaran in Gran Canaria. The luxurious vessel has everything you need for a relaxing day at sea; soak up the sun on the terrace, treat yourself to a drink from the bar, enjoy lunch, and look out for turtles and dolphins from the deck. The half-day cruise includes a stop to swim, snorkel, or even take a banana boat ride.